Los Roques, situated near the coast of Venezuela, is an archipelago where the star is the bonefish, found in large quantities and considerable sizes (from 4 to 10 pounds). Although Los Roques is considered a mainline bonefish destination, you will encounter other species - tarpon, permit and jacks. Situated approximately 85 miles off the coast of Venezuela and just a 35-minute flight from Caracas, Los Roques is the most important island of the archipelago, center of the public life of local people and visitors. 42 islands and 250 sandbanks, coral reef and calcareous sediments form this amazing place where the colour of the waters, a combination of blue, green and turquoise, will take your breath away. The island is currently populated by around 2,000 inhabitants who live of the fishing and tourism. The village is picturesque with the typical Caribbean atmosphere. Fishermen´s houses, recycled and painted with bright colors, are part of the landscape. The diversity of foreigners and local people gives the island a peculiar touch. Over 30 years ago, Los Roques was declared a national park in order to protect the wildlife and vegetation in the area. The center of the area consists of a lagoon covering about 400km2 that holds coral islands and numerous "pancake" flats .Los Roques has proved to be a desired destination for scuba-divers and fishermen from all over the world for the richness and variety of the marine live in its waters. 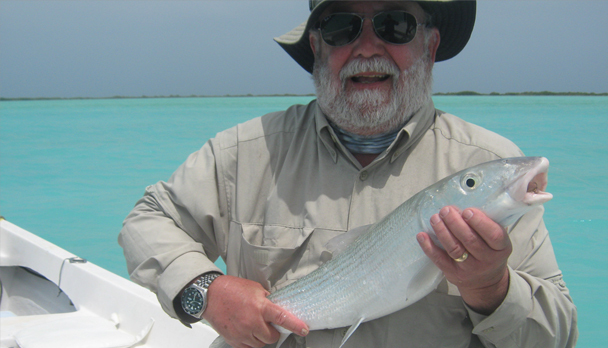 The star in Los Roques is the bonefish, found in large quantities and considerable sizes (from 4 to 10 pounds). It is a world-class destination for bonefishing in its own right. Although Los Roques is considered a mainline bonefish destination, you will encounter other species - tarpon, permit and jacks - as well all year round. 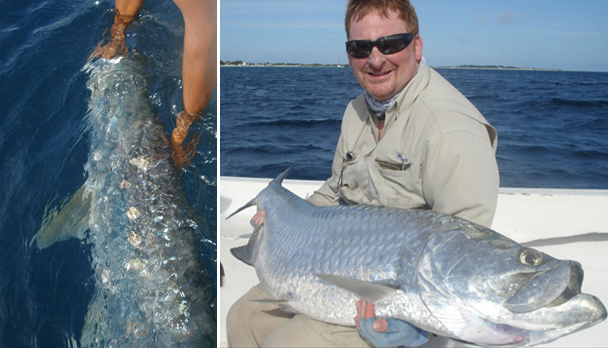 From November through February, large tarpon schools ranging from 40 to 150 pounds are seen. Fishing in Los Roques is done with well-qualified experienced local guides under the supervision of a Head Guide who has been fishing the area for over 20 years. Anglers are transported to the flats in 4 spacious 30 foot boats, powered by 75 or 90 horsepower outboards, with the assistance of a captain per boat. Although fishing is done for eight hours, departure time may vary depending on the tides. Our programs may include only the fishing, but we can include the air transfer Caracas/Los Roques/Caracas, assistance at Gran Roque airport and accommodation in a local Posada (inn) including all meals. There are many Posadas in Gran Roque; most of them used to be fishermen´s houses and have been recycled to accommodate up to 6 or 8 anglers. All of them offer special packages including breakfast, lunch and dinner. Rates range from U$S 100 to U$S 250 per day/person. We are offering rates which may vary from U$S 150 to U$S 190 per day/person in double basis (sharing room). The lodges we recommend are right on the beach or very close to it, to make access to the boats easier. In the package we can include one or two nights accommodation in Caracas (Hotel EUROBUILDING EXPRESS) and a safety transfer airport/Hotel/airport. Charter flights are available for groups from 4 to 6 passengers. This is a convenient option for three main reasons: the flight can be arranged for any time of the day (from 7 am to 5 pm), you are allowed to carry more weight than in regular airlines (which allow 20-pound per pax maximum), and the cost per passenger is similar to the one paid for regular flights. The aircraft is a Cessna 402. We suggest bringing one #7 Wt or #8 Wt rod for bonefish and one #9 Wt or #10 Wt for tarpon and permit. High-performance reels with a good brake system are required, capable of holding 200 - 250 yards of 20-pound backing. Weight forward floating fly lines; an Intermediate line is recommended for tarpon. 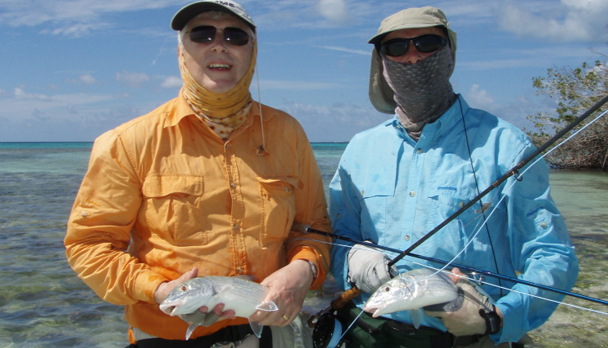 For bonefish and permit, use 12-foot knotless leaders, and 12-pound fluorocarbon shock tippet. For tarpon we recommend 50 or 60 pound fluorocarbon, and in some cases a 80 pound shock tippet. Bonefish flies should be light-weight and with a hook protection: Clouser Minow, Crazy Charlie, Bonefish Special, Gotcha and small crabs tied on hooks #4 or #6, sand and light-brown (unweighted eyes). The "Gummy Minnow" is a terrific pattern for high tide. Permit: Rag Head Crab, Brown Special, Velcro Crab and Del´s Merkin tied on hooks #2 and #4. For tarpon and snook: streamers, deceivers and seaducers on hooks #1/0 brown and orange, black and yellow, orange and yellow, olive and white, Black Death and Purple Death. The "Gummy Minnow" #1/0 is a terrific pattern for tarpon. Rates include: Reception at Caracas airport and transfer to the EUROBUILDING hotel. 1 night accommodation in the hotel in double basis. Flight Caracas/Gran Roque/Caracas. 6 nights accommodation in the Posada with breakfast, lunch and dinner with non alcoholic beverages. 5 full fishing days with boat, a well-qualified guide and a captain. Fishing licence. Rates do not include: Personal insurance, hard drinks, dinner in Caracas, boarding tax, Los Roques National Park fee, fishing equipment and flies, additional expenses and gratuities. Notes: Alternative quotes can be made for different durations. Single room and/or guide service. The fishing was very good since the beginning of the year, a lot of bonefish as usual and not so many tarpon, but the the ones fished were of very big size! As far as permit, some had been seen but always difficult to fish and find in quantity. Back in one piece from Los Roques. the transfer, Pedro, who was a really nice chap. Hotel in Caracas was fine but the city has no charm whatsoever but perhaps we missed the best bits! Rooms of the hotel in Caracas (Tamaco) were fine but the water was not crystal clean. Pedro collected us in the morning and flew us to the island together with his father, very competent pilot both of them. The posada owned by Juan was fine, had some problem with the hot water in the showers. Food got better as week went on and they began to see what we liked. Staff all very friendly. Fishing fine and that was excellent as it always is. I think we were the only visitors as never saw or met anyone else. did the last part to the International Airport, in good time. A trip that surpassed our expectations! We got back on Saturday morning. We had a fantastic trip which surpassed our expectations. The fishing was much more varied than I had expected. 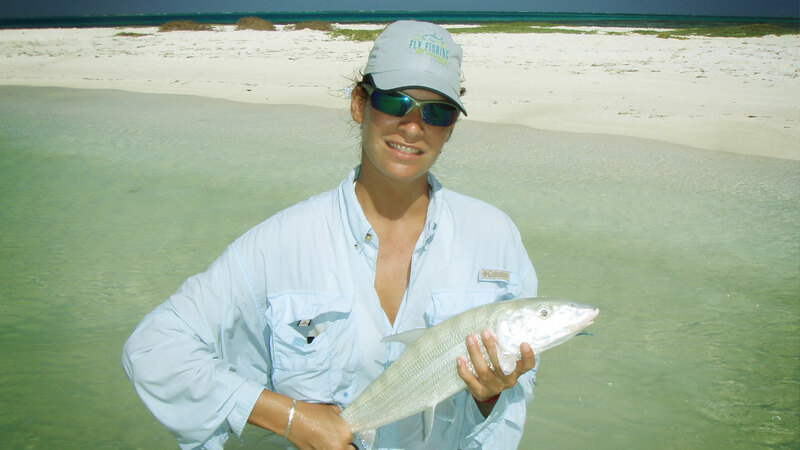 Los Roques has an unfair image of being primarily a bonefish destination fishing with gummies from the beach. This is only a small part of the experience and we had enough fishing around the Cays, that we hardly did any beach fishing at all. 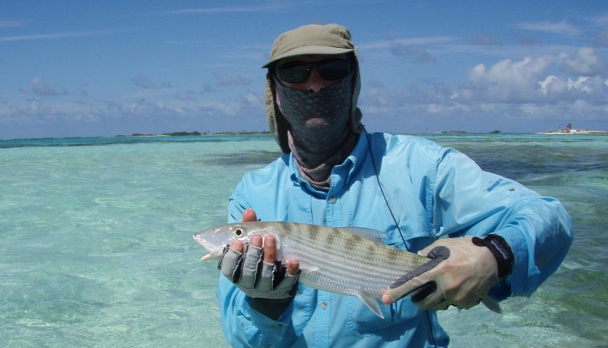 Bonefish were plentiful around the varied flats of all descriptions where the bones would charge off with your line you had to learn to hold your rod as high as possible to avoid the coral cuts far off in the distance. Grateful for my 10ft 7wt to give that extra height! 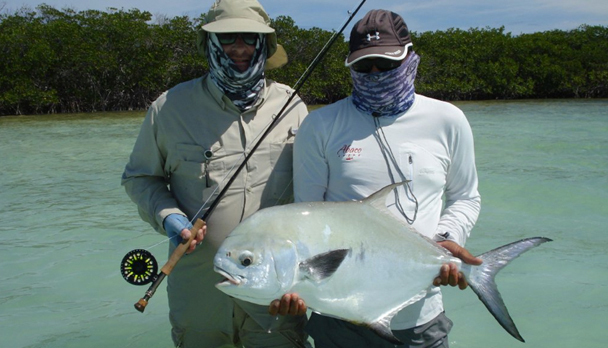 Beyond bonefish Felipe got me into a horse-eyed jack and two very decent "fish-of-a-lifetime" permit over two days. I couldn't believe my luck. On the chase of my first ever permit all hell broke loose when a large bonefish snapped my crab and a distressed Felipe desperately trying to get me to hoist in the fish to continue the chase for the two large permit. We fished for baby tarpon in the lagoons and giant tarpon rolling through enormous bait-balls. We also got into tarpon off Gran Roque and after one running straight for a mooring chain from a yacht I managed to land a 110lb tarpon after a 1 ½ hour fight. So it was a trip of many firsts for me and my group and I managed to top everything off in the last afternoon with a 5lb bonefish sighted and hooked myself on the perfect sandy pancake "Cayo dos Viejos". We all enjoyed the rustic chic of Posada La Terraza and Juan and his team made us feel right at home. Hearty and healthy food with some fine touches that made it memorable. We had some small issues in carrying our luggage around the airports, with scarce help and also with the excess of baggage. Plane schedules are not very liable, so it's always good to be prepared for delay. I look forward to another trip back to Los Roques or perhaps Cuba. I am also looking at the potential to bring my family next year. My kids love to fish and bones from boat or beach would be great for them! The trip of the decade! I want to drop you a line and a couple of picks of my recent trip with my buddy Sean Hogan to Los Roques. Never having been to Venezuela I began an online search which led me to your company. It was the best decision I could have made. This trip lived up to all my expectations and beyond. From the meet at Simon Bolivar Airport to the hotel in Caracas, from the plane ride to the lagoon and the posada you put us in, from the guide, Filipe to the great meals, this trip could not have been better. We caught a lot of bones, some good sized and all fighters. We both hooked into big tarpons right off the beach and I boated my first big tarpon. We hunted for bones and permit and were successful with the first and tantalized by the second. Sean's comment was "I would like to come back and do nothing but stalk big permit". You may be hearing from us again. The only hitch was the pick-up at the airport on the way home. It worked out well and we took the hotel shuttle when the driver missed us. A minor inconvenience. Once again I do not feel that anything could have been better. It was the trip of the decade for both of us. Los Roques - A very enjoyable trip! 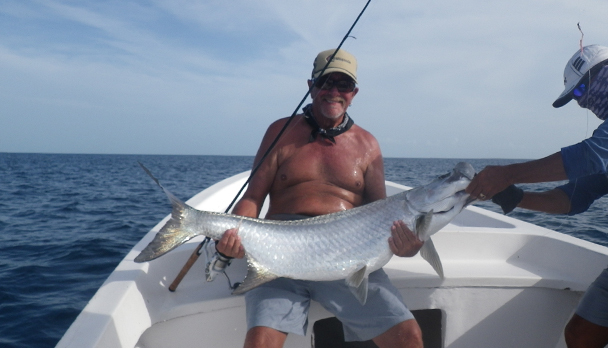 Our trip to Los Roques was very enjoyable and we had excellent accommodations and good fishing. The La Terraza staff were personable and meals were delicious. All the connections were very smooth and no problems. 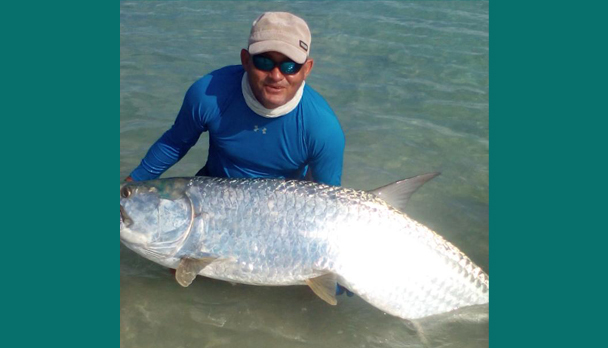 Los Roques - A 6 hour fight with huge Tarpon! We had a very good week. Our guides were Guareke, José and Alex; and Pedro who replaced Jose for a couple of days. Pedro was outstanding and excellent english speaking. José was also very good and Alex was good! The guys enjoyed very much, since they fished many tarpon and one of them was immense - 200lbs plus in deep waters unfortunately because it took them 6 hours to land it!!! The Lodge very nice, spectacular attention and excellent cuisine. Blanca was very kind with us and took well care of the Group. Unfortunately, Juan Fierro was sick in Caracas and couldn't meet him. The weather wasn't exactly what you expect in Los Roques; cloudy most of the time and one day of storm. Anyhow we enjoyed it a lot. Thanks for organizing the trip. I´d like to let you know that everything turned out marvelously and we were delighted with Los Roques. In Los Roques, the posada La Terraza was absolutely excellent. The place was very nice, the people that run it did everything they could to make our stay really comfortable, and the food was the best of all. The chef cooked something different each day and all the dishes were top quality. With regard to the fishing, we did quite well. We saw many permit, a lot of bonefish and some tarpon, although the last ones seemed a bit lost. One thing for sure, the ones we spotted were very big. In the end I managed to land three permit, one of which was huge. The guides were also very good. We had already met one of the guides, but we didn´t know the other. I must say that both of them have a wide experience and are very nice. 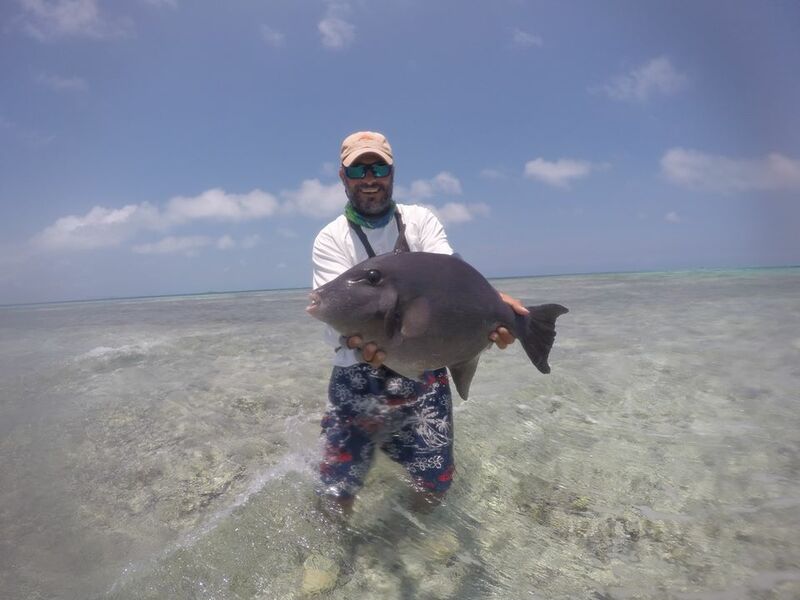 We will surely go back to Los Roques next year, as the combination of good fishing and accommodation in the posada makes it one of the most attractive destinations I´ve ever visited. We have just returned from a fantastic trip to Los Roques. We have just returned from a fantastic trip to Los Roques. Thank you so much for your efforts. Five of our group had flight trouble arriving later, you handled their issues seamlessly and even got them a half day of fishing the day the arrived. Any saltwater trip is subject to weather and we had incredible windless weather for 5 days, it was amazing. All 12 of our group caught numerous bonefish, we jumped tarpon and had excellent opportunities at permit. The Barracuda action was super and we caught Jacks and Snappers as well. 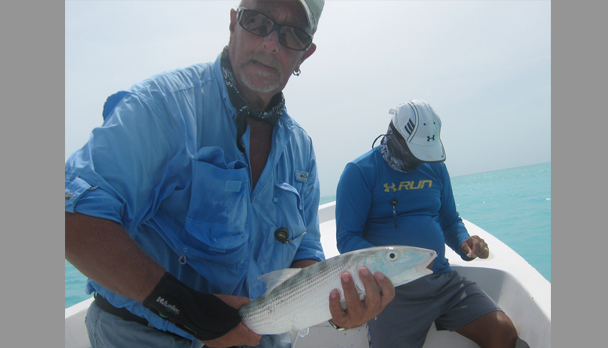 The variety of fishing at Los Roques is a highlight. Pancake flats, miles of white sand beach's, long near island flats and cay's. Our hosts at the Posada went the extra mile for us, service at the lodge was excellent. Our cuisine was fresh fish and vegetables, quality unlike anything we had experienced in the Caribbean. Overall the trip was one that makes you want to go right back and do it again. Everything turned out very well; the trip lived up to all my expectations, and I could also say it was even better than I had expected. The service, the food and the facilities the posada offered were absolutely perfect. The bonefish fishing was excellent. Feeling this fish race away is the same as I had been told. What can I say about the fishing of tarpon? It was amazing. I still find it hard to believe I had ever caught fish of that size. During the 5 days I went fishing with Felipe, I had strikes, cuts of the leader, hooks that bent. I was able to land 4, and each of them was beautiful and fierce. On the last day, I caught 2 of those 4 tarpon, one in the morning and the other one in the afternoon. As I said before, I cant believe it. The equipment worked perfectly, and although I ran out of flies in sizes 6 and 8, we could sort it out and I was able to fish without any trouble. What can I say about the place that you don't know? This place is heaven, or at least a piece of heaven. I am sincerely grateful for all your services and your help with the last-minute problem with the air ticket of Aerolíneas Argentinas. Thanks a lot. Everything worked out perfectly well. I hope I can go back some time. As it is said, it becomes addictive. It is a shame it is a bit expensive, but it was worth every cent I saved. A big hug, and thanks again. Los Roques. We had a lovely trip. Thank you very much for setting us up for such a lovely trip to Los Roques. 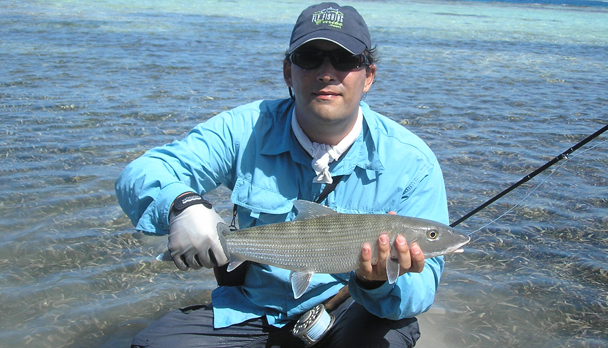 Felipe was one of the best guides we have had for bonefish - knowledgeable and easy to be with. The weather was mostly very windy - even 30 mph+ winds, and quite cloudy but it didn't really matter as we enjoyed ourselves very much. We felt like honored guests in Juan and Josefina's home and the staff was very sweet also. Great service! The food was very good also. We don't know as yet when we may be able to return to Los Roques - perhaps next year. Thank you again for your service. We had a lovely trip. Los Roques. The week was excellent in every sense !!!! The week was excellent in every sense. The group was harmonious and the fishing was more than acceptable, with a special performance of the ladies. The rhythm was quite intense, as we got up at 6 am, and at 7 am we were already on the boat heading for the flats. We waded, rathen than fished from the boat. We had a short break for a picnic and finished by 15.30 in the afternoon. Afterwards, we were free to make the most of the day scuba diving, walking the island or just relaxing. The trip, from the fishing point of view, ended up with a great strike by Ronny Bothlingk, who succeeded in catching a 120-pound tarpon. Everyone in the group agreed that this programme should be repeated as many times as possible. The depressing point is that we have just come back, and that means there is still a long time to go back. Los Roques. What a great trip !!!!!!!! What a great trip, thank you for all the support and arrangements, it was very relaxing, as it seemed everything was well taken care of. Los Roques. This review is one big thankyou to Daniel and all is team! this review is one big thankyou to Daniel and all is team! if your reading this review your probably doing what we were doing last year ,scannng the internet looking for a saltwater fly fishing holiday at a competitive price thats were we came across flyfishingcaribe. if like us your a bit rusty or just novices and are not sure about taking the plunge, well as Daniel said to us the best way to gain experiance is to jump in and enjoy! we will look after you, and he was good to is word. we arrived in Los Roques by plane from Margarita as we combined our fishing trip with a beach holiday.now the first thing you notice when you fly over las roques are the fantastic colours of the sea from the deepest blue to the lightest tourquise lapping on a multitude of islands and beaches,then after a brief circuit of the island your down on the small runway of Gran Roque. checkin is a full 5 mins and that includes luggage collection,then its off to your posada ours was the very relaxed but well placed La Cigala run by enrique, liana and there team. after a warm welcome,quick change and some breakfast we were racing across the sea with the other guests to our own private island for a day of snorkling,beach wandering and relaxation beach chair umbrella and lunch provided. after returning to the posada that evening it was dinner and a few drinks before an introduction to our guide Felipe. then its to bed by 10pm ready for the following days fishing. philippe arrived at 7am prompt checked all our gear then we strolled down to our boat moored on the beach (yes a full 50m away) then we headed off to an area were Felipe kept saying BIG TARPON !. now remember we are novices and have not quite mastered flyfishing on dry land never mind fishing from the front of a boat rolling on the waves in the harbour,but with some good coaching and plenty of encouragement from Felipe plus the sight of big golden tarpon rolling infront of us the nerves eased and we were casting "not pretty "but good enough. then after a few hour its of to the flats and after lunch its casting to bonefish,now as they say practice makes perfect and boy do we need practice ! anyway back to the posada to wash and get ready for dinner as i walked in thats when disaster struck and i lifted my rods into the ceiling fan which promtly cut the tops off all 3, now youve heard the expression (cut the atmosphere with a knife) this was on of those times, it was also one of those times when DONT WORRY WE WILL LOOK AFTER YOU was needed.now las roques isnt the best place to buy tackle so with the help of henrique is tool box some superglue and a multitool repairs were carried out . (the needed beer was supplied by nicholas) but just in case liana had put plan 2in place and had spoken to Felipe who kindly turned up with is own rod to lend us should the repairs not work . the next 2 days came and went so fast with the tarpon promising but not delivering ,but the bonefish and the jacks were very obliging and with plenty of coaching and the patience of a saint fish were landed and smiles recorded and for that we must thant Felipe the guide ,instructor and anchor retriever. all to soon your racing back to your posada for the final evening relaxing .thinking back nothing beats walking down a beach casting to bonefish with the anticipation of a take ! so if your a novice or a pro then jump in and enjoy. so all in all we have a few big thankyous to say ! to Henrique , Liana and there team at la cigala for the warm welcome the relaxed posada (it was like being at home)and for the help when disaster struck. and finaly to Daniel for arranging the fishing, flights and the posada and more importantly for keepintg the promise of DONT WORRY WE WILL LOOK AFTER YOU . Los Roques. Everything turned out perfect !!!! Daniel: Everything turned out perfect. Natalia enjoyed diving immensely and I caught over 40 bonefish in 3 days ( in the flats and even tailing). I was also able to cast at several permit, cut some jacks and hook a couple of tailing yellow tail jack. I made the most of my tackle #6. It helped me hook a couple of bonefish weighing 8 pounds approximately, according to what Chapin said, which emptied my Abel completely. You know how much I like bonefish fishing above all and this trip added emotion. The posada was perfect and I am really looking forward to my next trip to Caracas. Thank you for your dedication and good service. To summarize it was the most pleasent and productive trip I ever had. The fishing was great, even though the tides were a bit low. The guides were excellent . The camaradery phenomenal . And finally the service at La Cigala was second to none. Very attentive staff. Cesar was great. Had a great time with Alex and his guests. Los Roques. The fish were a bigger average size !!!!!! Many thanks for arranging our recent trip to Los Roques, the Bone fishing was very good, the fish were a bigger average size than we expected and played better than their weight. The guides were excelent - world class. The accommodation at the Posada was comfortable and very friendly and the charter flights/transfers worked to schedule despiste your warning about Venezuela. Los Roques. We spent a wonderful week !!!!!!!!! I am writing to congratulate you on the organization of our trip, which, from our point of view, was perfect. We spent a wonderful week and we highly praise your work as the host. I truly believe that when someone works well, we should let that person know. With regard to the "Posada", I would also like to point out that we really loved it and that we felt very comfortable. Well, Daniel, we´ll keep in touch as I would like to travel with you in the future. I am very interested in Mexico or any other destination you could suggest. A strong hug and thanks for everything. I had a wonderful time in Los Roques, and would do it again in a heartbeat. Los Roques is such a beautiful place: still unspoiled, with lots of fishing opportunities. 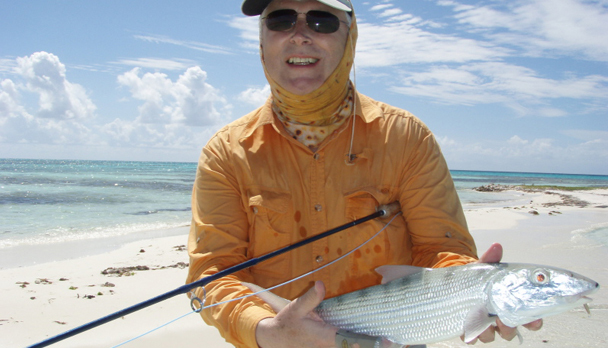 Although hard to catch from time to time, the bonefish were plentiful and surprisingly large, on average. The guides were excellent and patient with my somewhat inexperienced fishing partner. And I enjoyed the Posada where we stayed. The staff was attentive, and the meals were varied and tasty. I realy enjoy this kind of small grouping, and I loved the way you hosted the trip. From day one, you treated each of us like a personal friend, and that set the tone for an easygoing, laid-back week. The prizes awarded after dinner each evening for our successes and mishaps was a nice touch. Thanks for turning a potentially disastrous trip into something very special. Although my luggage never arrived, it was hardly missed because of the generosity of you and my fellow anglers. P.S.--My luggage, with all belongings intact, was waiting for me at Caracas Airport upon my return. Los Roques. Kirk and I had a superb time on our trip! We had been to Los Roques before and spent the days negotiating with local fisherman to get us to the flats and spent the nights clearing sand out our tents! 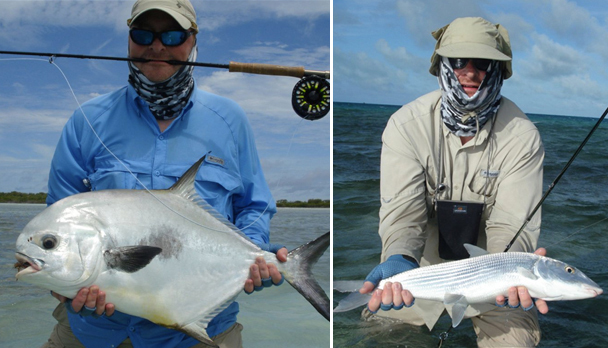 This time we vowed to do it in comfort and Fly Fishing Caribe provided exactly what we were looking for. First and foremost, the bone-fishing on both the Los Roques signature pancakes flats and mangrove bordered coral flats was excellent. We fished most mornings for bonefish and each landed between 6-10 fish per day in the 3-6 pound range. We did catch a couple of 7-8 pounders and although great in the photos, I believe the 4-5 lb fish give the best account of themselves. In the afternoons (after a great lunch) we normally changed tactics and targeted either schooling Horse-Eye Jacks or Tarpon. We had success landing several Jack up to 10 lbs and although we all jumped large Tarpon (40-70lb) none were landed - Excluding Daniel who landed a nice 80 pounder and another weighing about 90 pounds ! We try not to mention the 10 lb Permit Doug lost too often as the wound is still too raw! The guides, Pedro and Jose, were great. They managed to put us on top of schooling Jack, rolling Tarpon and tailing Bones on a daily basis and that is all we can ask. They provided expertise and help where needed but once our eyes were more accustomed to the colours and shapes, they allowed us to catch our own fish without the constant "strip stop strip stop" that can take the "hunt" out of the sport. After a hard days fishing there is nothing like a relaxing shower and a cold beer to reminisce over. Our Posada - La Cigala - provided both and the meals they produced on a daily basis where outstanding. A big thanks to the crew at La Cigala. Without doubt, Los Roques is a fantastic fishing paradise !!! Without doubt, Los Roques is a fantastic fishing paradise. This was the first time I had traveled with FlyFishingCaribe and it was really very good. The fishing guides are excellent. They were two spectacular fishing days, full of bonefish. The fishing on my first day was excellent. I took plenty of bonefish. The first bonefish I caught was eating with his fins out of the water. It was the most beautiful thing I´ve ever seen in my whole life! I managed to catch some more but I also lost about four because of the coral that cut the line. We went fishing from the shore later. I caught a lot too. They were crazy and hard to catch. At the end of the day, I had landed some 6 pounders and taken many photos!! On my second day, we went fishing more difficult spots, in sea-weed flats, looking for fish while they were eating. It was great. The tide was very low in the morning; however, we caught some and we spotted a lot of fish. The afternoon yielded better. I succeeded in catching some more, including a 7- pounder, according to the guide. It was an unforgettable experience. Thank you, Pedro, for your guidance and your clever eyes. 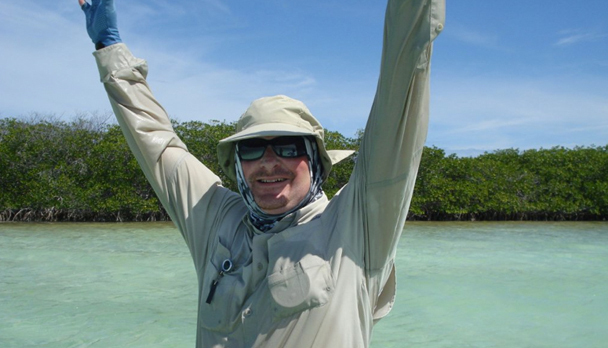 Thank you, FlyFishingCaribe, for this wonderful experience. Thanks for all your help in arranging the trip, the fishing was really good. Jose the guide was very good, and his ability to spot fish was unreal, without his skill you would only catch about 10% or less of the fish we caught during the week. I was pleased to see that he would take me on long distance boat runs to the farside of the atoll, to flat he knew would produce,and also flats that had not been fished rescently. I caught about 60 bonefish during the week with the best about 7 lbs with a average of about 3lbs. The last day was really good because I was casting to tailing bonefish, which meant that even I was able to see them. I caught 4 tarpon best about 25 lbs, which took along time to land as the hook was quite small and the fish very strong. Turtles,Stingrays,Barracuda,Sharks and Jacks, were seen everyday , along with the fantastic colours of the sea. The boat rides alone were worth the cost. Other fish caught included small snappers, 4 Jacks about 4lbs each and a needlefish of about 3lbs,which jumped about 20 times. Had a brilliant time - exceeded my already high expectations -caught & lost big tarpon - fantastic. I'll do you a fuller report later. hour before finally breaking my line at the backing, taking all the fly line with it ! Estimated at 35kgs. Fortunately I had another spare line, and it is certainly good advice to make sure you do have spare lines! Had one afternoon for Permit which was a great bonus, managed to cast at about 5 of them with no success, but I could see what all the excitement was about. Many many thanks for organising, the trip exceeded my expectations which were already very high and I would certainly look in the future to fish with your company again..."